I’ve been publishing an offline newsletter (Seductive Selling) for almost 10 years now. It’s one of the most exciting things I do, and it’s something I truly enjoy doing, every month. 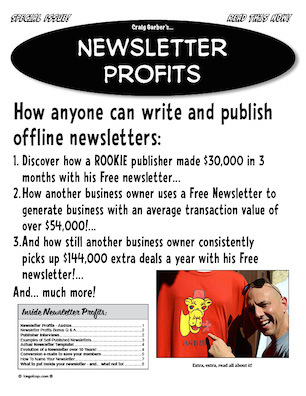 Thursday at noon, I’ll be launching my next product, Newsletter Profits. The program takes you by the hand and shows you how anyone can easily write and publish a Free or Paid For, offline newsletter. And by the way – although Seductive Selling is a paid for newsletter, I also published a Free Newsletter for 2 years when I was a financial planner, many years ago. And, in Newsletter Profits, you’ll hear from me, as well as from clients of mine, who publish both free and paid for newsletter models – and who benefit tremendously from both of them. Why are offline newsletters so important? See, one of the biggest reasons why your conversions are low, is lack of contact. But when you’re providing a monthly newsletter to your prospects and customers, they’re reminded of you, and they interact with you, regularly. Plus, you’re building this relationship much differently than how any of your competitors are trying to build it. Which makes you stand out above them. Unique because offline reading (as opposed to reading an e-mail or a web page, for example), is a very solitary and very private act. So if you’re content is engaging (and if it’s not now, it sure will be, after you go through my program), then really… who else has the opportunity to have this kind of quiet one on one time with their buyers and prospects, for let’s say… 1-3 hours every single month? And that’s a LOT of time. More time than some people spend with their good friends, their co-workers, or even their spouses. This leaves you in a very unique position, which again, goes way above and beyond any of your competitors. Think about when you send out an e-mail… OK, so like with my list, I send out e-mails and in the PS of every e-mail I send out (and sometimes in a little breakout section in the middle, as well), I always include a link to buy something. I can get away with this and have very little unsubscribes because I’m proving good solid content, and content that’s entertaining, for the most part. Well now imagine what happens when you have a newsletter! Instead of one little e-mail, you’ve got 2, 4, 8, 12 pages of content. You can and should, easily slip pitches or promos inside your newsletter, or as a reference. In fact, an offline newsletter – whether it’s a free newsletter or a paid one, is a great opportunity for you to make both subtle, and direct pitches, offering a variety of products and calls to action. In my Newsletter Profits Program, I’ll show you HOW to sell, WHEN to sell, and WHERE to put your sales pitches, in your offline newsletter. We go LIVE, this Thursday at noon – but only for 7 days, and then the product is being pulled.